Need Help With a Spill? 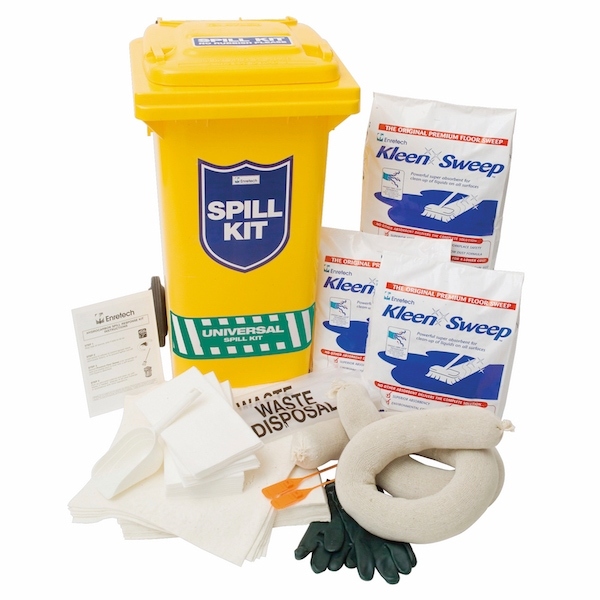 Able to contain and clean up both oil and water-based liquid spills, the Universal Spill Kit is designed to be used by any business that has identified risks due to spilt liquids. Effective on oil or water-based liquids such as paints, pesticides, herbicides, foods or any other liquid spill or leak that occurs in a controlled industrial, commercial, or transport environment. Designed for workshops, warehouses, grounds and building maintenance operations, manufacturing facilities or any sie that uses water-based chemicals. Industries include Government, Heavy Industry, Transport, Manufacturing, Service Industry, Construction, and Waste Management Companies. Highly absorbent — each kit absorbs up to 100L of oil. Combines both pads & powdered absorbents for quick & complete clean-up. No residues remain. Comprehensive solution — contains a combination of Enretech sorbents, PPE and clean-up accessories for both water-based & oil-based spills. Cost-effective — lowest in-use cost and superior performance results. Easy to use and transport — mobile kit for fast response, as well as being highly visible with the capacity for extra PPE. Industry accredited — sorbents tested to 12 NATA approved standards. Eco-friendly — Enretech absorbents offer significant environmental benefits over competitor products. NOHSC: 2007(1994), 1005(1994), & 1015(2001) and AS/NZS 3816:1998, AS1940-2004, AS3780-1994, & AS2507-1998. Looking for an Enretech spill solution? There are Enretech distributors across Australia and the world. Enter your postcode below to find the one closest to you. Can’t find an Enretech distributor near you? Give our team a call on +61 248 693 261 to find the Enretech products you are looking for.